This construction video tutorial will explain the various formulas which are used in slab, beam, column in the job site for over-lapping steel bars. Here, there are two zones for BIM – Compression zone and Tensile zone. The formulas are different for both the zones. 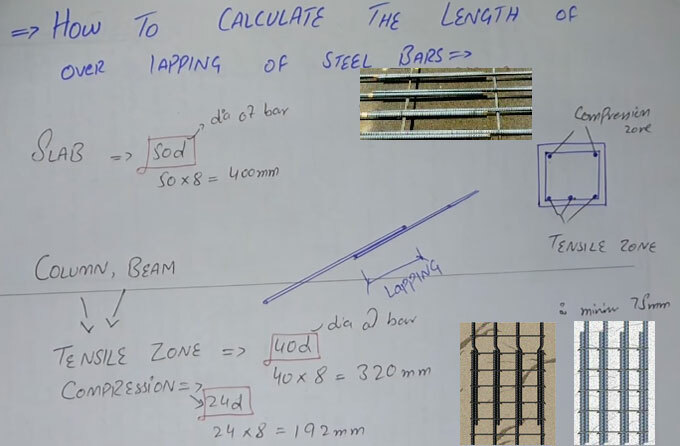 Overlap length in columns, beams and slabs denotes the distance intersection among two connecting reinforcement bars. While reinforcing a vast member, whether it a slab, column or beam, reinforcement steel should be joined in order to acquire a continuous effect. Tensional forces - Tension is only usable in solid strings. In tension, the force functions on the object is always external from the object. Compressional force - In compression, the force functioning on the object is internal to the object. It curtails the object. Compression is applied to transmit force as pressure in hydraulic systems.